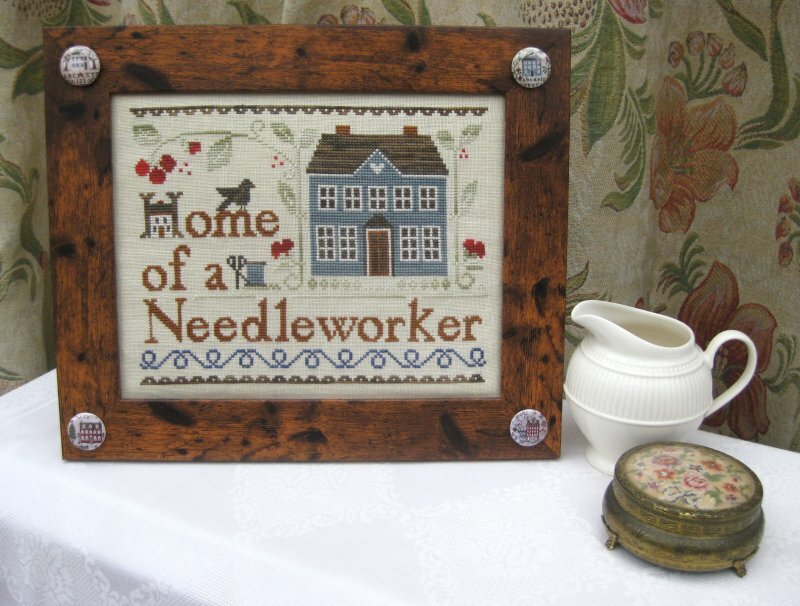 Home of a Needleworker (too!) – a quick cross stitch project! Sometimes, I just want to be stitching a quick cross stitch project; something simple and homely – and this project ticks all the boxes! 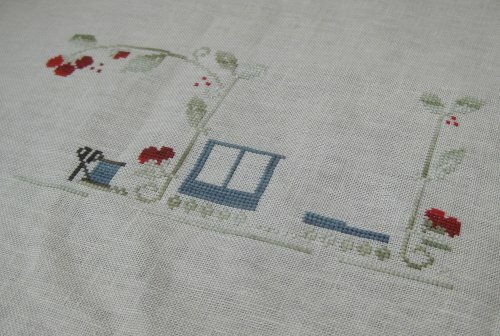 It’s a cross stitch chart pack project by Little House Needleworks, called ‘Home of a Needleworker (too!)’. 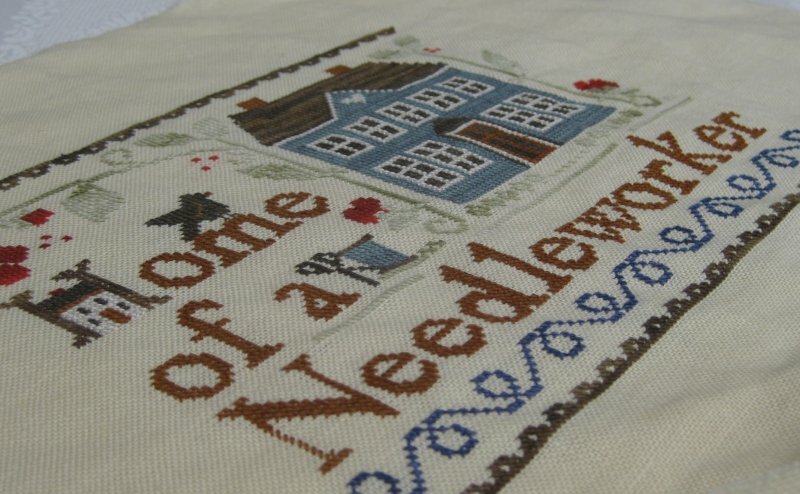 It’s called that because there is an earlier chart, very similar to this one, but more rectangular, with a different style of house, which is called ‘Home of a Needleworker’. I’d had that one on my wishlist to do one day….until I saw this one, and I bought it on impulse just before Christmas. Most of my new purchases go into an Edwardian chest of drawers that I store my needlework stash in, and don’t see the light of day for years, but with this one, I just felt I wanted to stitch it NOW, so I sorted through my stash for half the threads, and ordered the others (from Peakside Needleworks), so that I could get on with it immediately. The chart only uses seven colours, but most of those are overdyed, slightly variegated skeins, which gives more interest. I substituted some Silk’n’Colors threads for three of the shades, but ordered in the Classic Colorworks recommended shades for the ‘important’ colours. I did change the colour of the house itself slightly, as I felt the recommended shade of ‘Old Blue Jeans’ by Classic Colorworks was a bit too grey, so I bought a skein of ‘Dublin Bay’ shade instead, which has a denim look to it. I also used a skein from my stash of a dark blue for the wavy line across the bottom, as I used almost a whole skein of ‘Dublin Bay’ for the house, and wouldn’t have had enough left to do the whole line as well. I also bought a second skein of the tan shade ‘Brandied Pears’ halfway through stitching, as I thought I was going to run out while doing the lettering, but in the end I didn’t need it, so my stash has been boosted yet again…. The fabric I used was Zweigart’s Cashel 28 count linen in shade ‘Light Sand’, which is almost a cream. I bought a fat quarter from Sew and So, and used about half of it for this project. The chart pack is clear and simple – a black and white symbol chart, about life-size, to count from, and a page listing the materials needed, the stitch count dimensions, and the finished size (about 9 x 7 inches). I used a substituted colour (Silk ‘n’ Colors ‘Golden Moss’ 096) to do all the greenery, making sure that all my stitching was worked in horizontal lines across each shape, so that the variegations went in the same direction across the whole picture. I like the roof best – I used Valdani variegated stranded cotton P9 for this – it was left over from when I stitched the Autumn Quakers sampler by Rosewood Manor last year. The stripes look very much like tiles! This is the stitching completed, before I framed it. I think the cute little ‘extra house’ within the shape of the letter ‘H’ is a very clever touch! I originally bough this to stitch after seeing an image on Pinterest where someone had surrounded the framed picture with needle minders featuring houses, and I loved that idea. So, I bought four, to start off my ‘collection’, from Crazy Annie’s Stitchin. These first four ‘stick’ to the staples used at the corners to hold the picture frame together from the back – after that, if I get any more, I think I’ll have to cheat and stick them on, as there won’t be anything metal for the magnets to grab on to along the sides of the frame!! I can see a rather large collection coming on, though, as I just love little needle minders. 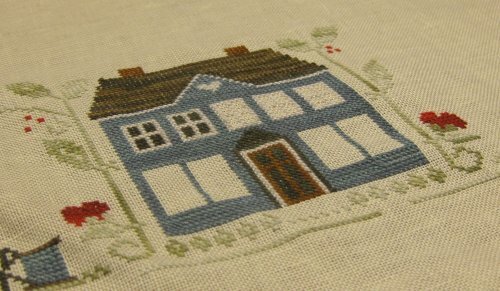 So, here it is – a quick cross stitch project of a dear little house, surrounded by even more little houses! What do you think of it? Have you stitched this one? 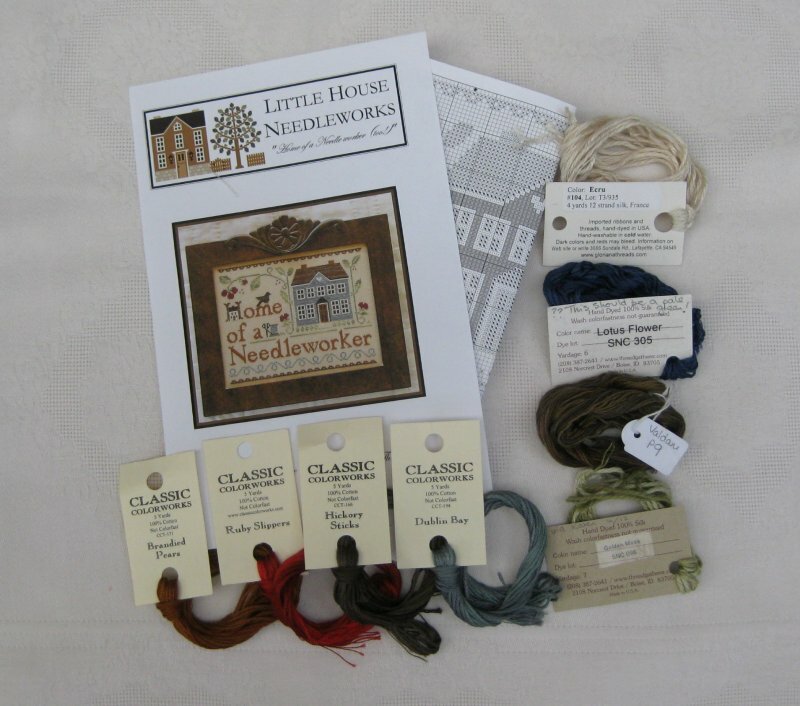 Author Janet GrangerPosted on January 18, 2018 January 17, 2018 Categories Home of a Needleworker by LHNTags Cross stitch, Home of a Needleworker, Little House Needleworks, needle minder4 Comments on Home of a Needleworker (too!) – a quick cross stitch project!